The final proofing cabinet is intended for the final proofing of the dough products in the confectionery and bakery production. Final proofing cabinets differ in many parameters: the size of the working space, the number of laying-out levels, the power consumption, the control board features, the dimensions. Based on the cabinet functionality, the optimal model can be chosen. Call us by phone and our manager will advise you on all issues related to the final proofing cabinets. LLC PKP "BAK" provides its customers with reviews from operating bakeries and bread-baking plants on the supplied bakery equipment. 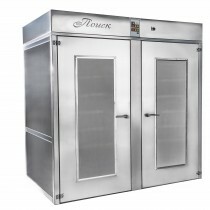 We guarantee the quality and reliability of POISK final proofing cabinets by LLC PKP "BAK".